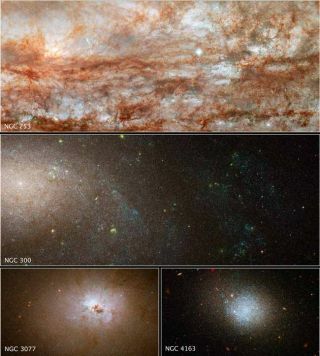 These images taken with NASA's Hubble Space Telescope are close-up views of four galaxies from a large survey of nearby galaxies. Astronomerspeering out into our cosmic backyard have long understood that the Milky Way'sgalactic neighbors only seem similar on the surface. Now a detailed survey fromNASA's Hubble Space Telescope has revealed the diversity of those galaxies asthey evolve over time. TheACS Nearby Galaxy Survey Treasury (ANGST) program zeroed in on 14 million starsin 69 nearby galaxies. Such galaxies sit close enough so that Hubble's sharpeyes could single out the brightest stars instead of seeing a giantsmear of light, and may help settle raging debates over how galaxies andtheir stars form in the first place. "Insteadof picking and choosing particular galaxies to study, our survey will becomplete by virtue of looking at 'all' the galaxies in the region," saidJulianne Dalcanton, head of the ANGST survey at the University of Washington inSeattle. "This gives us a multi-color picture of when and where all thestars in the local universe formed." Thesurvey covered galaxies ranging 6.5 million light-years to 13 million light-yearsfrom Earth. A light-year is the distance light will travel in a year, or about6 trillion miles (10 trillion kilometers). Manynearby galaxies contain stars that are positive relics compared with the youngerstars in more distant galaxies. Astronomers can guess how those youngerstars may evolve based on the older nearby stars. "Usingthe galaxies in the nearby universe as a 'fossil record,' we can compare themwith young galaxies far away," Dalcanton said. "This comparison givesus a history of star formation and provides a better understanding of themasses, structures and environments of the galaxies." Theformation of galaxies remains poorly understood, although evidence is mountingthat massive galaxies grow by clumping together and merging with smallerbrethren. This step-by-step evolution of gradually larger galaxies competeswith the theory that galaxies simply start from scratch. However,some observations suggest that galaxies do have the power to expand rapidly.Astronomers found a star factory 12.3 billion light-years away that churns out 4,000stars per year, compared with our Milky Way's 10 stars annually. That burst ofstar-making activity suggests such a galaxy would only need 50 million years togrow into one of the largest ever observed. Manysuch large spiral galaxies created most of their stars early on, according to aseparate new study. Also relying on data from the Hubble galactic survey, theastronomers examined the outer disk of M81 and found that most stars formedmore than 7 billion years ago, when the universe was half its current age. Thesupernova deaths of massive stars within such mammoth galaxies rapidly enrichedthem with heavy elements such as carbon. "Wewere surprised by how quickly the elements formed and how the subsequentstar-formation rate for the bulk of the stars in M81 changed after that,"said Benjamin Williams, an astronomer at the University of Washington inSeattle. Astronomershad believed that star populations become increasingly younger further outwithin galaxies, but Hubble data indicated that older stars can also lurk in agalaxy's outer arms. Recent simulationwork has presented another possible explanation — stars may wanderall over spiral galaxies. The survey should provide further data to fleshout current theories. "Withthis information, we will be able to trace the complete cycle of star formationin detail," Dalcanton said. Thegalactic survey results were submitted for publication in The AstrophysicalJournal Supplement Series. The research on M81's star-formation has beensubmitted to The Astronomical Journal.